Founded by the French, Pakse sits at the confluence of the Mekong River and Se Don (Don River) and is the riverside capital of Champasak Province. It's the gateway to the south and to the four thousand islands of Si Phan Don in the Mekong River, an archipelago of islands set amongst a beautiful maze of waterways and home to the elusive Irrawaddy dolphin. Nearby the Bolaven Plateau offers cool climes and the chance to discover tea and coffee plantations, minority tribal villages and the most beautiful waterfalls of Laos. The ruins of Wat Phu, although on a much smaller scale, are said to rival those of the ancient temples of Angkor. Upon arrival you will be met by your driver and guide. With your guide, explore the Bolaven Plateau, a fertile highland area formed by an ancient volcano and famous for its high grade coffee and tea plantations. It is home to a number of ethnic minority groups and tribal villages, some of them still practicing Stone Age culture by using extremely primitive agricultural tools and conducting frequent spiritual ceremonies. The largest ethnic group found on the plateau is the Laven, and other groups include the Alak, Katu, Ta-oy and Suay. There you visit the Tad Fan Waterfall, a picturesque twin chute waterfall, and the nearby local tea and coffee plantations. We then continue to Pakxong where we visit the Jhai Coffee House. This philanthropic coffee roaster buys from the source and reinvests all profit back into the region. Meet the roasters; learn about coffee and their social enterprise.We then journey back to Pakse, and continue to Champasak, arriving at your hotel by early evening. After breakfast you will travel to Wat Phou, an ancient Khmer religious complex dating back to the 5th Century. This dramatically sited temple is one of the highlights of any trip to Laos. After your visit you will be brought back to your hotel before noon, with the rest of the day at your leisure. After an early morning breakfast, we cross over to the mainland and drive south to Ban Hatsaikhone, where we board a local private boat for a boat tour of the 4000 Islands. We reach the picturesque island of Don Khone by lunchtime, and in the afternoon explore the island by bicycle, tracing the route of an old abandoned railway and admiring some of the old French Colonial buildings, and the beautiful Liphi Waterfall. 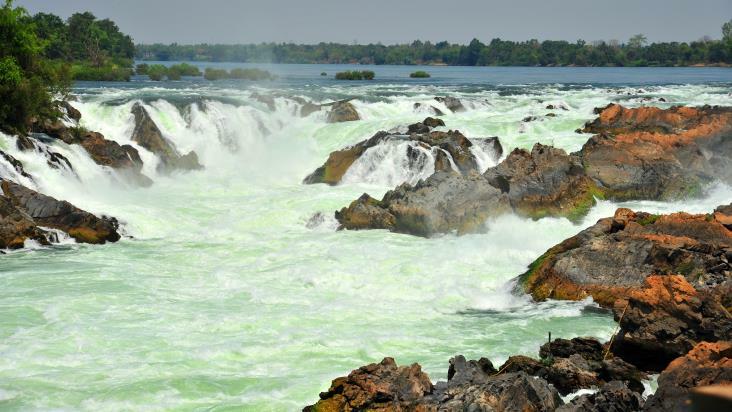 We then return to our boat and head back to the mainland, visiting the spectacular Khone Phapheng Falls, one of the largest and most powerful waterfalls in Southeast Asia. In the late afternoon we drive back to Champasak arriving there by early evening. On your last day enjoy some free time until your departure transfer. Visit UNESCO pre-Angkorian Wat Phou temple. Visit the island of Don Daeng, home to a number of pre-Angkorian ruins, Buddhist temples, an ancient forest stupa and a protected forest. Trek Phou Khong Mountain with overnight homestay in Ban Mai Singsamphan. Tree Top Explorer 2 or 3 day adventure trips that include canopy walks and zip-line traversing steep gorges.